The majority of people who step through the doors of the Sip of Hope are well aware of its mission. 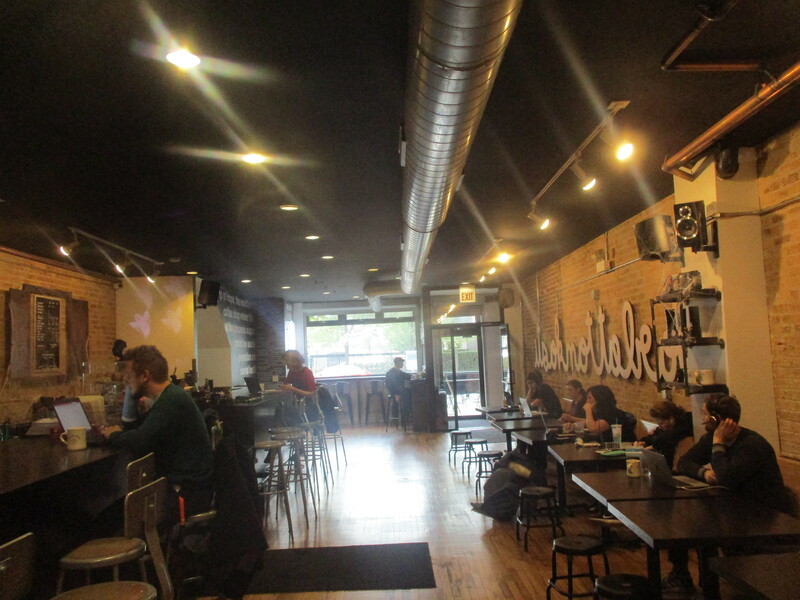 But even if they aren’t, this Logan Square coffee shop doesn’t exactly beat around the bush. 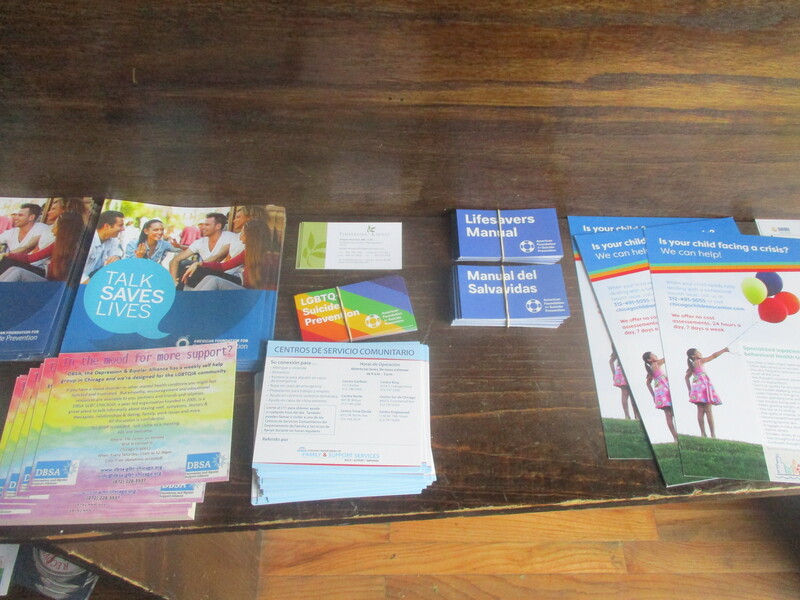 The vestibule has a small shelf with flyers and brochures for mental health service providers on the right, and a bulletin board on the left. And, once a person walks into the main space, the message on the wall to the right spells out the mission. As Sip of Hope manager Brian Kmiecik told the Chronicle, the idea was to act as a bridge. 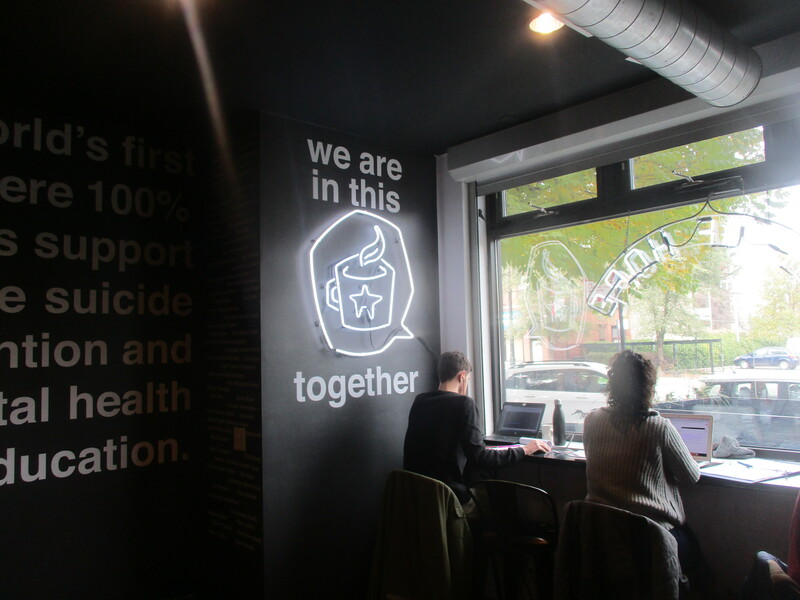 Whether they are experiencing mental health issues or they know someone who is, Sip of Hope aims to provide resources they can use, as well as generally to serve as a safe, comfortable space where people can talk about mental health issues. The coffee shop is already doing community workshops to address the issue — something that it looking to expand on in the near future. 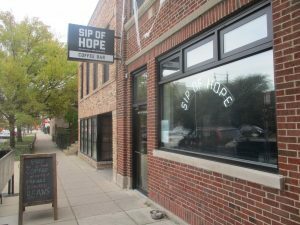 Sip of Hope is a product of a collaboration between Hope for the Day, a Lakeview-based nonprofit, and Dark Matter Coffee, the Ukrainian Village based coffee roaster and coffee shop chain. According to its website, Hope for the Day was founded in 2011 by music event organizer Johathan Boucher after his boss and mentor Mike Scanland committed suicide. By that point, eight people Boucher cared about committed suicide, and Scanland’s death was the last straw. He wanted to let people who may be contemplating suicide know that there are hotlines and resources that can provide help and support — and the nonprofit grew from there. Kmiecik explained that Hope for the Day teamed up with a number of organizations to get the word out. Dark Matter Coffee jumped at the idea, and they put together a special “Sip of Hope” blend. The packaging has the information about the mental health resources, and all of the proceeds from the sale went to Hope For the Day. Hope For the Day raised the money to open the coffee shop, with Dark Matter Coffee providing support and their own blends. Sip of Hope opened around six months ago at 3039 W. Fullerton Ave, across the street from the Logan Square branch library. Kmiecik said that it wasn’t a coincidence. Kmiecik said that the growing development in this part of the neighborhood, as well as proximity to Blue ‘L’ Line’s California/Milwaukee and Logan Square stations didn’t hurt, either. And he noted that mental health care was a sensitive topic in Logan Square. When the City of Chicago closed half of the city-run mental health clinics, the neighborhood’s clinic was one the facilities that got the ax. Since then, community organizations and volunteers throughout Logan Square and the neighboring Hermosa and Avondale community areas are working on establishing a special taxing district that would use property tax revenue to fund a community-run mental health clinic — a campaign that, Kmiecik said, Sip of Hope fully supports. He explained that Hope For The Day runs the shop as a social enterprise. While it does use the proceeds to cover employee salaries, rent, utilities and other expenses necessary to keep a coffee shop running, everything that’s left over goes directly toward the nonprofit’s mission. “It’s not helping a guy get a second condo on the Gold Coast,” Kmiecik emphasized. He said that the flyers and brochures in the vestibule come from organizations Hope For The Day either worked with already or vetted. And everybody on staff went through crisis intervention training. If someone was to walk in while having a mental health crisis, the staff is trained to provide support and get them to a space where they would be safe. Most of the time, Kmiecik said, when people do come in, they haven’t reached the crisis point. Sip of Hope provides a safe place, and, aside from picking up informational brochures and flyers, they can talk to staff about, for example, what it’s like to have a therapist. In many cases, people who walk through the doors had a friend or a loved one who “completed” suicide. Kmiecik said that it important to acknowledge that the experience was traumatic, and they need support, too. And Kmiecik said that he was pleased to have mental health professionals holding meetings at the Sip of Hope. Overall, Sip of Hope wants to serve as a bridge between the community and mental health resources. 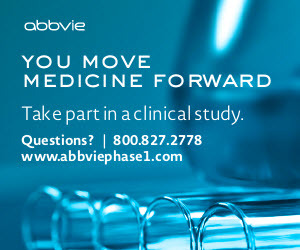 And they want to do their part to reduce the stigma surrounding mental health. Too often, people are encouraged to try to ignore or push past their issues without actually addressing them. He said that the staff are taught to think of it as like opening a soda bottle after it’s been shaken. “If you just take the cap off, it’s just going to explode, but if you slowly release those bubbles, it’s not going to explode in your face when you take your cap off,” Kmiecik said. When asked what one can do to deal with the stigma, he said that simply talking about mental health goes a long way. So does checking on friends who are showing signs of depression — acting out of character, becoming distant. Overall, he said that the response from the community has been positive. While he wasn’t sure he could put the exact number of in, Kmiecik felt that the “majority” of the people came to Sip of Hope to support its mission. While they get customers from Chicago and its suburbs, they’ve also gotten visitors from out of state. Once, they even had a family from Canada stop by. In the near term, Sip For Hope plans to expand its monthly mental health workshops. Kmiecik said they will be doing more workshops on specific topics, such as Post Traumatic Stress Disorder among first-responders — which, as the Chronicle recently reported, is something emergency services throughout Chicago area are paying more attention to. Sip of Hope is also looking to record the workshops and turn them into podcasts, so that people who don’t live in Chicago area can benefit from them.